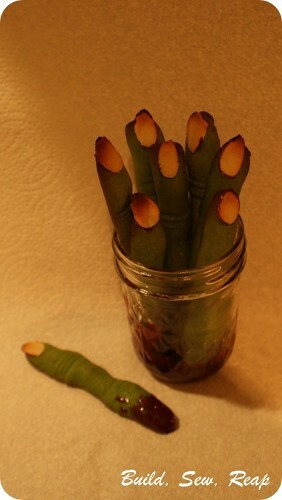 I've been seeing the witch fingers all over blogland so I had to get in on the action. My husband called midday on October 30 to say he had to take something to work for Halloween and wanted to know if I had any ideas. I jumped at the chance to bust out some witch fingers. They weren't as easy as you might think or at least they aren't if you don't bother reading any instructions and think you can just bust out some sugar cookies in the shape of fingers. First of all, you have to have a good thick recipe, like thicker and harder than play dough when it is well chilled. Next, you have to figure out how to shape them the way you like. I'm going to give you some tips here to save you the troubles I ran into. I used this recipe from AllRecipes.com which was PERFECT. 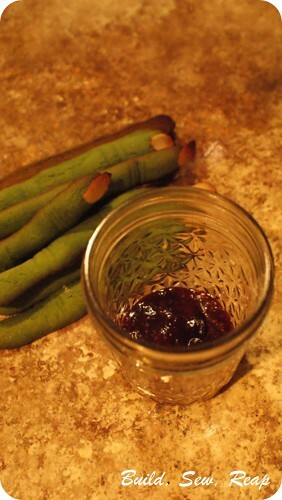 I added quite a bit of green food coloring (the gel stuff that's super potent). I also chilled it really well in the fridge for a few hours. I had somewhere to be so I mixed it up then covered it and tucked it in the fridge while I was gone. That ensured it held its shape when I rolled it. I rolled clumps of it into tubes thicker than a pencil but thinner than a standard Crayola marker. I used the back of a knife to press knuckle wrinkles into them. 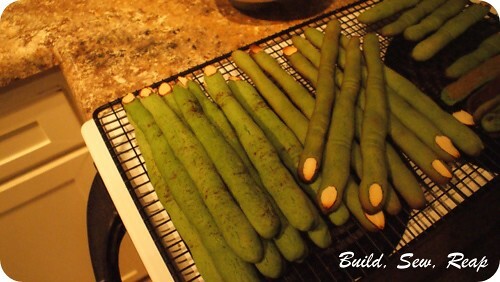 I used slivered almonds for the nails. Finally, I sprinkled them with some sugar and cinnamon to make them look dirty. My only regret is that I couldn't post this until after Halloween because I made these late at night on the 30th. I hope this will inspire some Halloween appropriate gore for you next year though!